1. Since the release of PEAF v2 in 2010, it became apparent that some things that PEAF contained, applied not only to the Enterprise Architecture domain but to the wider Enterprise Transformation domain. For this reason, POET was created and the things in PEAF that applied to the whole Enterprise Transformation domain were moved into POET. In addition, because POET now considered the wider Enterprise Transformation domain there were new things that were added to POET. 2. 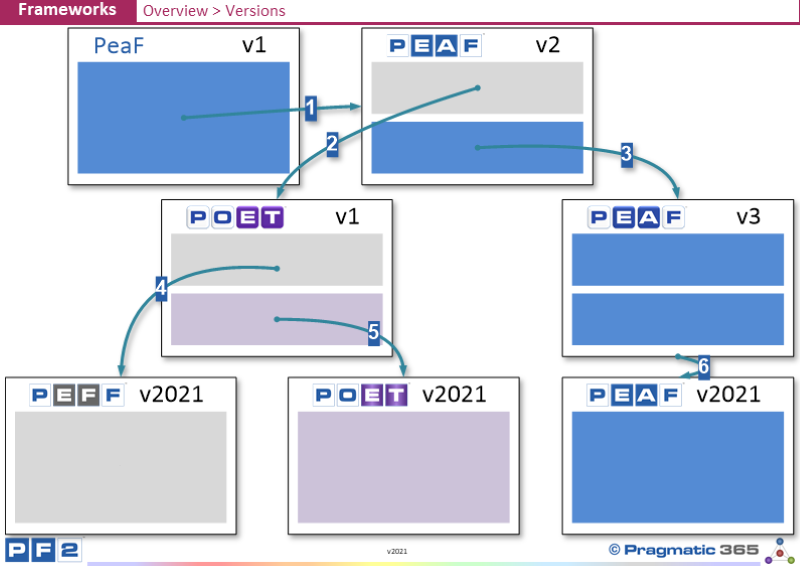 PEAF v3 was then created by taking the things from PEAF v2 that were purely concerned with the Enterprise Architecture domain, adding more things, and restructuring the content to conform to the new structures that POET had created..
None of this was pre-planned. Did you know PEAF v2? Do you know the difference in domain, between POET and PEAF?